Primacyt Primary Keratinocytes for Keratinocyte Cell Culture. An excellent overview and summary about keratinocytes is Keratinocyte methods by Irene M. Leigh and Fiona M. Watt. Culture techniques and grafting methods, assays of adhesion, proliferation and growth factor production, and a variety of other topics are described in detail. default_titleGeneration of epidermal and differentiation models. default_titleWound healing and treatment of dermal burns. default_titleStudies on skin cancer, and toxicity. default_titleStudies on the behavior of growth factors. default_titleStudies on the effect of cosmetics. default_titleSuperior cell morphology and proliferation rates. default_titlePRIMACYT human keratinocyte cells are cryopreserved at passage 1 (P1). default_titleKeratinocytes are derived and characterized from single human donors, allowing variability comparisons with regard to certain donor properties. default_titleHuman epidermal keratinocytes are isolated from the juvenile foreskin. default_titleProliferating cell cultures are made from cryopreserved cells, which have been thawed and cultured at PRIMACYT. Growth performance is tested through multiple passages up 16 population doublings. default_titleHuman epidermal keratinocytes are delivered in vials. Each vial contains more than 500.000 viable cells after thawing. International orders for delivery within the EU including Switzerland are usually 24-48 hours. Delivery to other locations will be jointly determined individually. The cells are tested for morphology, cell viability, and adherence rate. Growth performance is tested through multiple passages up to at least 16 population doublings. Each vial contains more than 500.000 viable cells after thawing. Proliferating cell cultures are made from cryopreserved cells, which have been thawed and cultured at PRIMACYT. PRIMACYT warrants its cells only if the recommended thawing protocol is followed. Product warranty limits our liability to replacement of this product. No other warranties of any kind are provided by PRIMACYT. default_titleCryopreserved cells are shipped in dry ice. After delivery: Store below -130°C. On the basis of the individual donor anamnesis, symptoms, and local endemic conditions there is minimal likelihood that pathogens are present. This product is therefore considered as “Exempt Human Specimen”. default_titlePRIMACYT humal epidermal heptatocytes are for in vitro research only. They may not be used for diagnostic or therapeutic purposes. 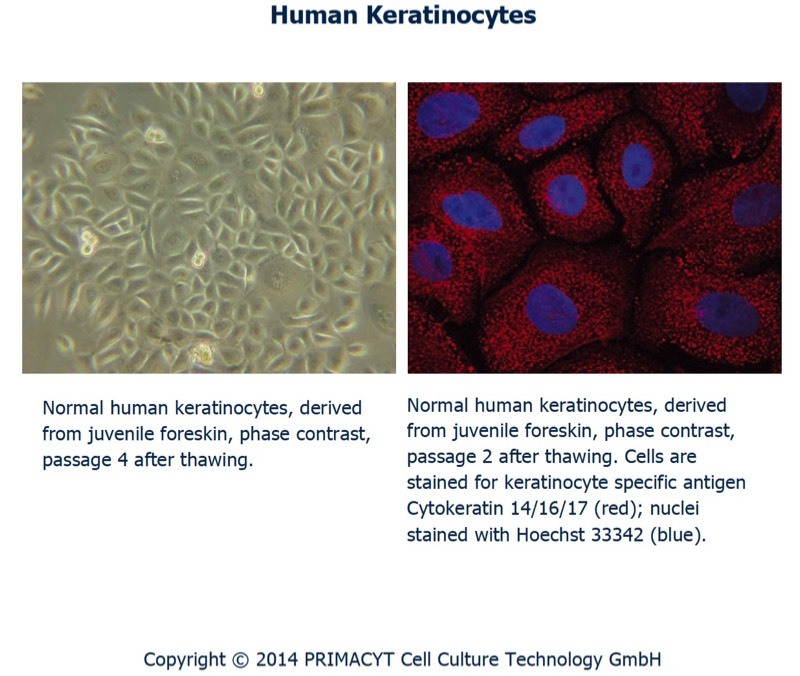 Normal Human Keratinocytes are available as cryopreserved cells. For ordering, please insert the lot number and quantity in the respective column for the cells as described above. PRIMACYT Normal Human Epidermal Keratinocytes - Juvenile Donors. Available as cryopreserved cells. Options by Skin and Cell Biology / Characteristics after Thawing available.